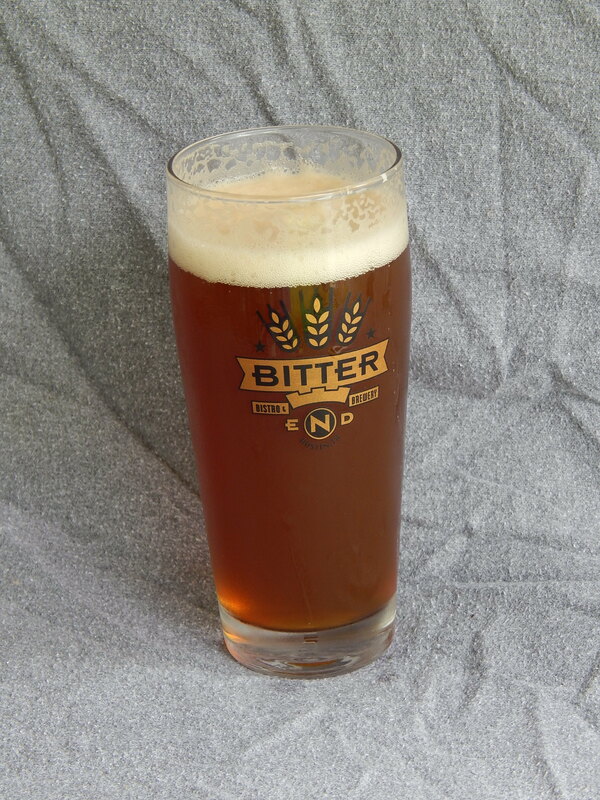 A copper-colored, moderate-bodied, bitter, malty ale. This is the second beer in the second series of Surefire Extract Beers. The first series presented five homebrew recipes that played to the strengths of malt extract and stovetop brewing methods. The second series continues this idea, and started with an English best bitter. The key to brewing this beer well is to ferment on the cool side of the ale fermentation range (65 °F/18 °C), and cold-condition the beer for a few weeks before serving. If you want your alt to be as traditional as possible, use Spalt hops instead of the Tettnanger hops specified in the recipe. (However, if you’ve never tasted Spalt hops before, be aware that they have a unique flavor that’s not to everyone’s liking.) Likewise, if you want to stick closer to tradition, cut the amounts of late hops and dry hops in half and lower the carbonation a bit. 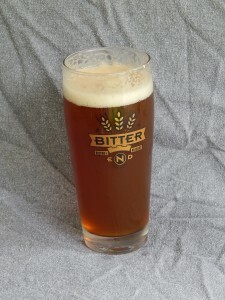 A copper-colored, bitter ale with a rich, Munich malt character. Moderate body, with the flavor and aroma of Tettnanger hops. In your brewpot, begin heating 2.0 gallons of water to a boil. Aim to reach boiling when the grain steeping (actually a small mash) is done. In a separate, large (8-qt. or larger) pot, heat 2.8 qts. of water to 163 °F. Place crushed grains in a steeping bag and submerge in this second pot. Hold temperature around 152 °F for 60 minutes. In a third pot, heat 2.0 qts. of water to 170 °F to use as sparge water. After the grains have mashed, place a colander over your brewpot, set the grain bag in it and pour the wort through it (to filter out solid pieces of grain); then, rinse it with the sparge water. Stir in half of the malt extract and bring the wort to a boil. You should have about 3.0 gallons of wort. Do not let wort volume drop below 2.5 gallons during boil. (Top up with boiling water, if needed.) Once boil starts and the first bits of hot break show, add your bittering hops and boil for 60 minutes. 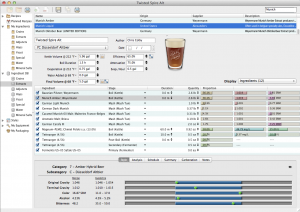 Add remaining hops at times indicated. Add Irish moss with 15 minutes left in boil. Stir in the remaining malt extract in last 10 minutes. (Dissolve it in a small amount of wort first to make it easier to stir in.) Chill the wort to 65 °F and transfer it to your fermenter. Add cool water to make 5.0 gallons and aerate thoroughly. Pitch yeast and let beer ferment at 65 °F. When fermentation finishes, let sit in primary for another week, then rack to a secondary fermenter. Let condition, preferably at 60 °F or below, for an additional 2 weeks. Keg or bottle and carbonate to 2.5 volumes of CO2. In your brewpot, begin heating 7.6 L of water to a boil. Aim to reach boiling when the grain steeping (actually a small mash) is done. In a separate, large (8-L or larger) pot, heat 2.6 L of water to 73 °C. Place crushed grains in a steeping bag and submerge in this second pot. Hold temperature around 67 °C for 60 minutes. In a third pot, heat 1.9 L of water to 77 °C to use as sparge water. After the grains have mashed, place a colander over your brewpot, set the grain bag in it and pour the wort through it (to filter out solid pieces of grain); then, rinse it with the sparge water. Stir in half of the malt extract and bring the wort to a boil. You should have about 11 L of wort. Do not let wort volume drop below 9.5 L during boil. (Top up with boiling water, if needed.) Once boil starts and the first bits of hot break show, add your bittering hops and boil for 60 minutes. 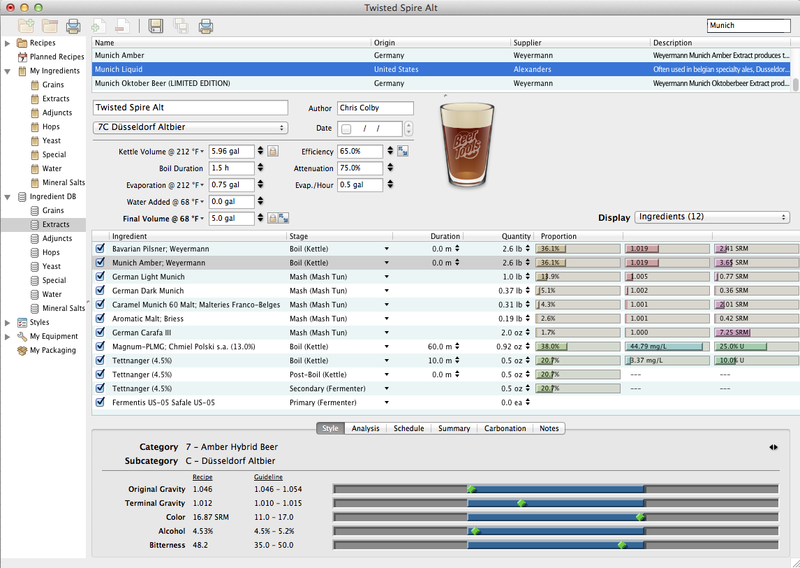 Add remaining hops at times indicated. Add Irish moss with 15 minutes left in boil. Stir in the remaining malt extract in last 10 minutes. (Dissolve it in a small amount of wort first to make it easier to stir in.) Chill the wort to 18 °C and transfer it to your fermenter. Add cool water to make 5.0 gallons and aerate thoroughly. Pitch yeast and let beer ferment at 18 °C. When fermentation finishes, let sit in primary for another week, then rack to a secondary fermenter. Let condition, preferably at 15 °C or below, for an additional 2 weeks. Keg or bottle and carbonate to 2.5 volumes of CO2. 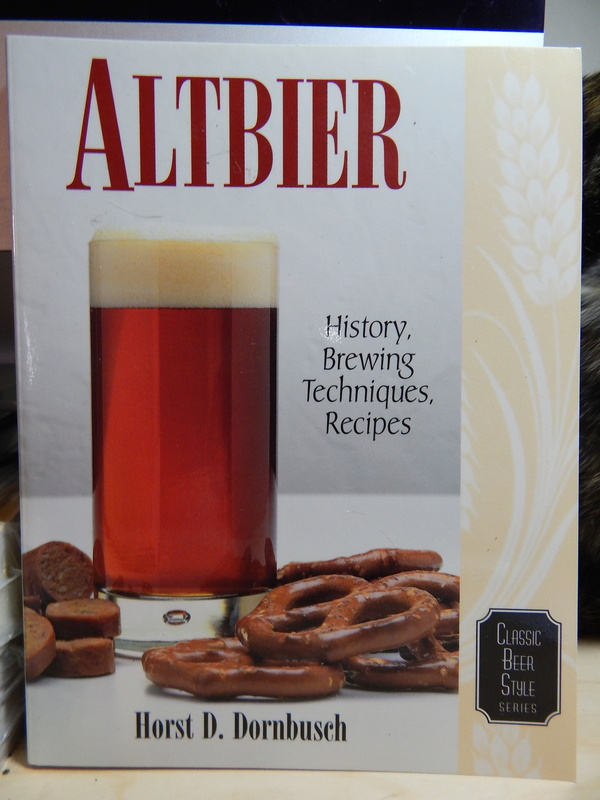 A book on brewing altbier. Very timely, I just drank 2L of Altbier today in Dusseldorf. 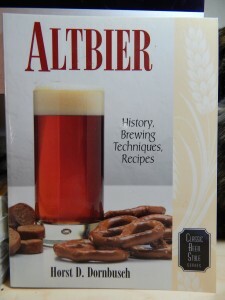 Looking forward to brewing up some of this great malty beer shortly after I get home!! And…I just took a picture of the Twisted Spire today. I wish I had drank 2 L of altbier today. Hope you like the beer.